This small nave and chancel church did not appear on a list of major buildings in Ferns in 1537. So we can presume it was built after that date. This might appear to conflict with the romanesque window in the south wall. 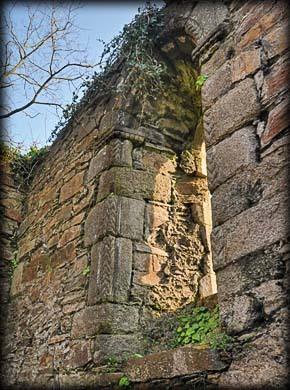 It is believed the this window may have come from the nearby, St Mary's Abbey or more than likely the romanesque church at Clone. The two lancet windows in east wall were probably also inserts from another church. St Mogue's Well, 40 metres to the south of here, also has architectural fragments believed to be taken from Clone. The church has a plain rounded chancel arch, pictured in the top image, and there are small niches in the chancel walls. Very little remains of the nave, most of the walls are only about a metre high. But during conservation it was discovered that the nave was longer than the present ruin suggests. 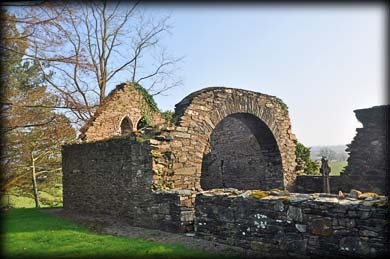 If you do visit Ferns it is well worth taking the small walk from the monastic site to St Peter's. Situated: From Ferns walk north on the N11 passed St Mogue's Well. About 40 metres beyond the well there are few steps on the left. Follow the path to the church. Discovery Map 69: T 0229 5002. Last visit Mar 2015.